Among the wedding design style moreRustic becomes popular. Translated from the French, the word means village, rural, and creates an atmosphere of natural beauty, naturalness, naturalness. 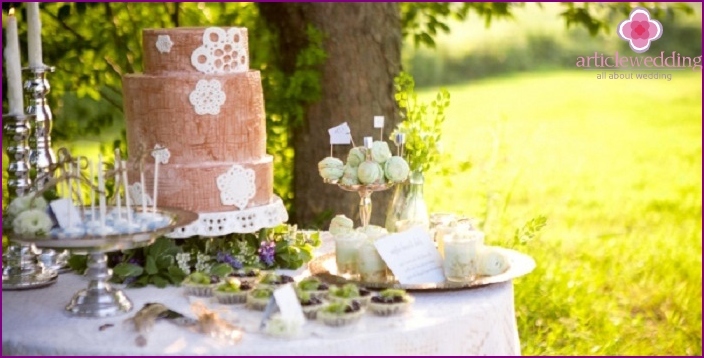 Wedding cake for such a holiday should also radiate natural beauty and charm. Because of its simplicity emphasized, it is easily manufactured at home, or may be ordered at the confectioner. How to make a dessert? 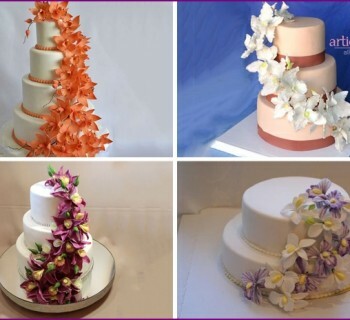 The main idea, rooted in the preparation of the cakeRustic style is beauty in a simple, natural. Therefore, for such decor uses natural elements and motifs taken from the environment. Not all decorations are edible, but many are absolutely natural. For example, a common eco-stand for cakes is a polished section of a tree trunk, the cakes themselves too often resemble him. When creating the main wedding feast may be easy negligence, reminiscent of home baking, and therefore creates an atmosphere of comfort, sincerity. 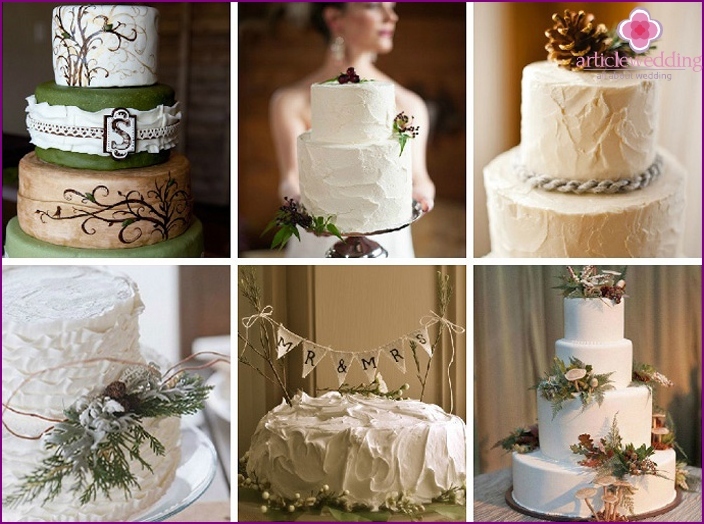 Rustic style cake can be as white asclassic wedding feast, but always in the spirit of minimalism. Korzh cream coated with, at least - a white mastic, decorated with soft colors or bright buds, twigs and berries. When applying the cream do not adhere to accuracy, this negligence tiers gives lightness, ease. 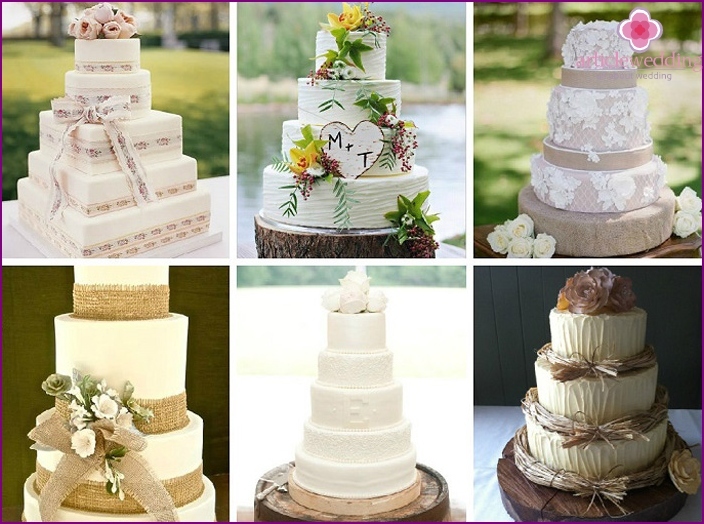 If the cakes covered with mastic, then each cylinder entwine decorative elements such as lace, thin burlap, twine or straw bundles. is an original rustic cakeswoodpile (from the word "log"), resembling a stump or a slice of a tree trunk. 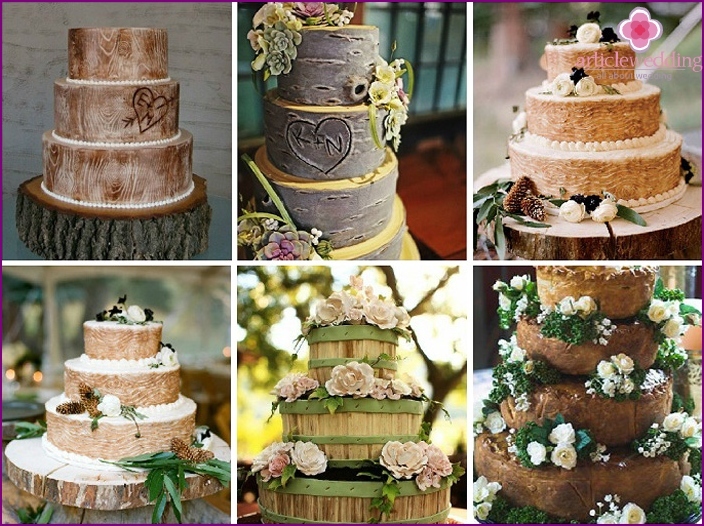 The exterior of cakes decorated with a bark of a tree, complete the composition of flowers and berries. 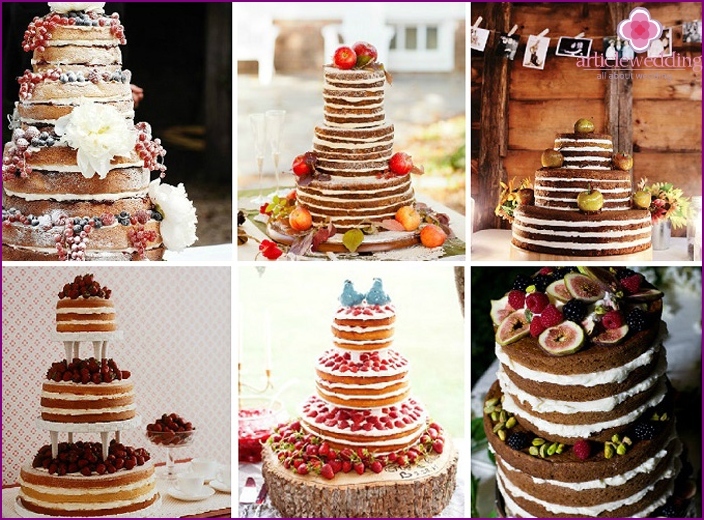 Cake-stack of causing delight guests and perfectly fits into the overall wedding style. Make a masterpiece at home is difficult, therefore it is necessary to turn to professionals. On this cake would be appropriate, "carved" a heart with the initials of the newlyweds. It looks symbolic and romantic! In addition to natural colors, are often the field, tenderroses or peonies, ornaments stand mushrooms (made with dough), branches (created from caramel, chocolate or natural), a small haystack, these bumps, linen ribbons and other elements of eco-romance. If you're targeting a country-rustic, you can install instead of the classic topper (figures on the upper cake), sweet cowboy boots or hats, twisted horseshoe, horses, harnessed to a cart. Naked called multi-layer cake or pie,the outer part of which does not smear. Cakes and cream, which they smeared inside, remain open for the present. Playing on contrasts, bakers often prefer dark or beige shortcakes to emphasize plies. Ornaments are the fresh whole berries that are displayed on the top and tiers of products, often in place of Topper. Among the berries are often spread some large buds. 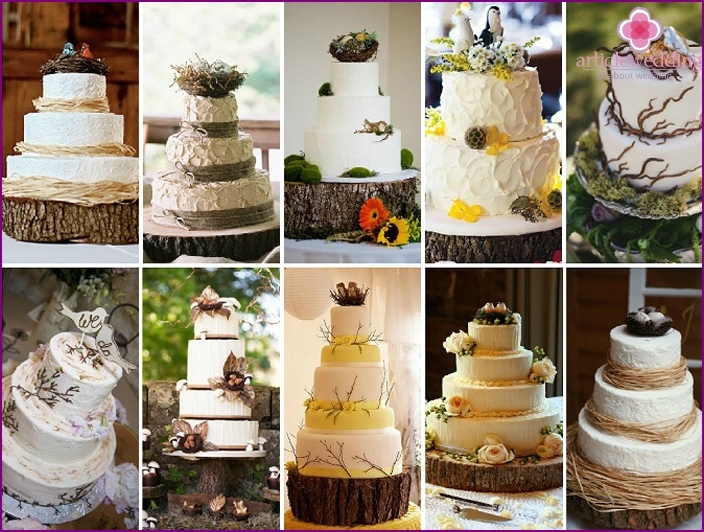 Naked cakes, as well as the woodpile - distinctiveRustic wedding feature. They are rarely white, often brown with bright decorative elements, and therefore look very appetizing. In contrast to the creamy dessert with floral decoration, flower buds that may lose freshness during the celebration, and the cream leak such cakes wait in the wings, without losing the original appearance. Another plus - the total edible goodies. A popular adornment for wedding cakes Rusticact with birds nests. It is a symbol of a new family, education, married couples, which is planning to have children in the future. This wedding decor fits perfectly into eco-friendly concept, which is rustic style. Nests are made of natural or edible ingredients, birds - of dough, chocolate or mastic, egg shaped chocolate. Birds in the nest or not often replace the newlyweds figures on the upper flat shortcake, but sometimes act and decorative element tiers. Like other rustic cakes, jewelrybirds are well in tune with the stand-woodpile, which are made specifically for the wedding dessert. cakes, cupcakes or muffins (in the form of birds' nests) - If the range of eco-tray is large, in addition to the main treats him extra treats can be placed. This solution is ideal for those couples who have booked a small cake. Rustic Style choose not only the couple, lovingromantic simplicity, but also those who marries autumn. 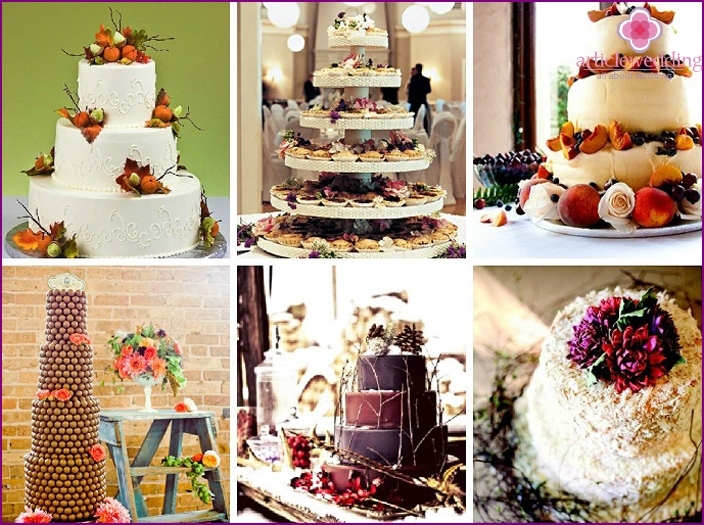 Autumn is full of colors, and it should be used when organizing a wedding. Rustic perfectly emphasize the beauty of nature in this period. Autumn cakes different from the typical eco-treats, bakers emphasize in their decor poetics yellowing foliage, using demi-season fruits and flowers. Manufacturers generally mimic yellowedmaple leaves with an elegant shape. They combine with the branches of trees, tangerines, longstanding colors - all this is done with the help of edible materials. Korzh coated with white (or pastel shades of beige, pink) cream to create a contrast with the "nature". 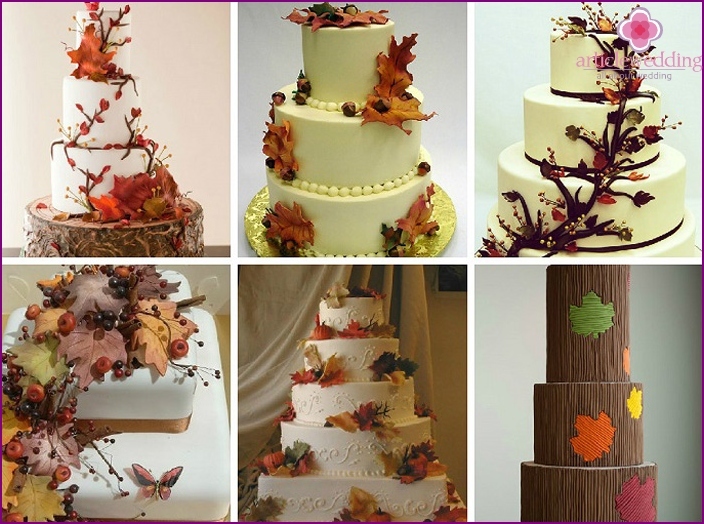 The result will be the effect on the wedding cake fallen leaves. For such a composition, fit and classic toppers - figurines of the bride and groom. 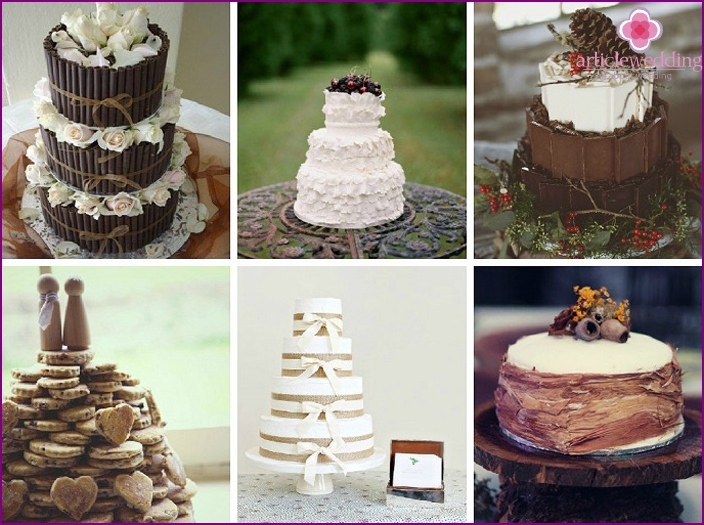 If you decide to order or bake rusticcake to the wedding, you must first decide on the size and design treats. He must not only be beautiful and harmonious in itself, but also perfect fit for decoration celebration. Look at the following examples of such confectionery compositions. 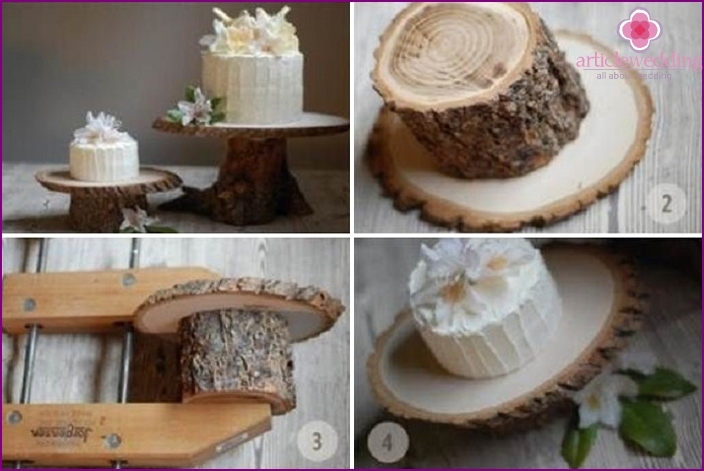 Perhaps one of the proposed ideas suitable for your wedding in a rustic style.